Sheer simplicity makes this a great necklace. Versatile enough to wear anytime. A beautiful bridesmaids gift idea! In many cultures, circles symbolize the female form, birth and fertility. 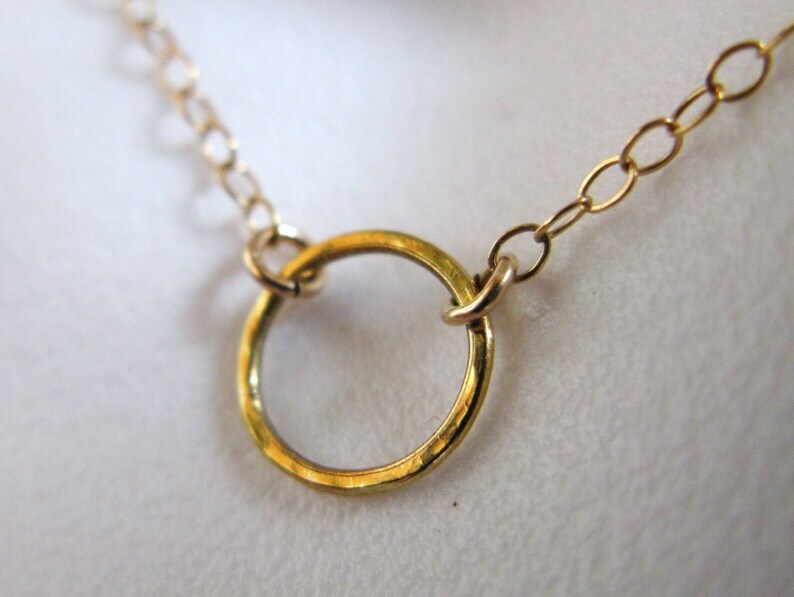 I have finished the dainty 10mm Gold Fill circle with a carefully hammered finish and suspended from a delicate 14K Gold fill chain. Ends in a lobster clasp. 16" long. If you prefer, I can also leave the circle smooth for a high polish flawless finish. Gold fill will last a lifetime with care! **Arrives in a tiny jewelry box lined with cotton. Ready to safekeep or gift. This was the perfect gift! My fiance loved it. Fast shipping and quality product. Awesome seller! I prefer paypal, but also accept money order or check if notified prior to sale. Items ship after full payment is received/cleared. Payment must be made within 7 days of purchase. The longer it takes for payment to be received, the longer it will take for item to ship, as items are made in order of payment. If you are not satified with your order, please contact Artwark immediately for a solution to the issue. Please note, custom items are final sale. Changes needed to a piece of jewelry may result in materials fees and all shipping charges will be incurred by the buyer. If you are not satisfied with your item, I am happy to do an exchange for you, or work with you for a solution we can both agree on. You must contact me within 3 days of receiving your item. **CUSTOM ORDERS CANNOT BE EXCHANGED OR REFUNDED. For custom pieces, I have to purchase and shop for specific materials for you. This takes time and energy on my part beyond just making an item. Please take this into consideration when selecting what you would like for a special order. I can always adjust length if need be as stated above. I make most items to order so please allow 7-12 days handling time for me to make your piece. You will RECEIVE YOUR ITEM about 2-3 weeks after purchase. It may be sooner, but may not be. Shipping is via USPS First class or priority mail. If you need your item for a special occasion and expedited ship are available and can be arranged for postage plus rush. I am happy to prioritize orders that need quick arrival to my best ability. Insurance is optional and recommended; Artwark cannot be responsible for loss or damages incurred during transit. international orders can take from 2-10 weeks to arrive First Class. Please be aware that your country may have additional taxes at customs, so if your item is taking a long time to arrive, contact your local post. USA/INTERNATIONAL ORDERS: Shipped via First class or priority shipping. If this is a gift, I offer free gift tags and special wrapping at request. Item will be sent to the ADDRESS YOU PROVIDE THROUGH ETSY, NOT THE PAYPAL ADDRESS. If you have not received your items, please verify that the address you requested is where you are looking and contact your local post in case it is being held there-especially for international orders. HANDSTAMPED JEWELRY: For my custom stamped jewelry, I hand stamp each individual character, one at a time onto the pendants, therefore, any fluctuation in the appearance should be considered a positive feature, giving the piece a rugged, unique look, rather than a flaw. If you are interested in a clean classic look, opt for one character only. Customized piece: If you have an idea for a custom piece, I am happy to comply. If you see something you like except for a few details, I can switch out metal, stones, shapes, charms, most anything at your request. I can also make matching items to complete a set of jewelry if you wish. I can make bridal sets, party favor pieces and much more. Feel free to contact me anytime for these requests. We have been lucky to have the chance to contribute to charities, fundraising events and causes. Including: The comedy event w. Eddie brille of the David Letterman show. Cancer Awareness, Well wishes (raising enough to build 4 water wells in impoverished villages in Africa/Asia) Haiti relief, the leukemia foundation, The children's hospital silent auction, Brain damage injury association auction, Dress For Success, Ghana Fundraiser, UNICEF, Japanese Tsunami Relief, etc. If you have an organization or charity benefiting women or children in need, or upcoming event that you would like Artwark to participate in, please contact the shop. For wholesale, please contact me. All items purchased from ARTWARK and sold elsewhere MUST be labeled as ARTWARK jewelry pieces, due to copyright. Selling ARTWARK under another name will not be tolerated.